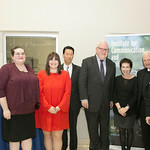 More than 125 University community members and visitors gathered on November 2, for “Speaking Truth: Religion in the News Media,” the inaugural event for the Institute for Communication and Religion within the College of Communication and the Arts. 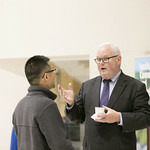 William McGurn, The Wall Street Journal columnist and a former presidential speechwriter, headlined the event, discussing how religion is presented in the press. 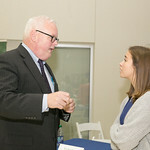 In his keynote address, McGurn said the United States has gone from a nation whose Founders recognized the role of religion in preserving freedom to one where faith is on the decline and many believers are too afraid of raising eyebrows to discuss their faiths openly. 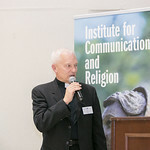 As a result, he concluded, many individuals have started to perceive religion in general as a “collection of irrational beliefs,” not worth protecting by law. According to McGurn, this loss of belief has resulted in a secular press that has become largely skeptical of religion. On top of that, the columnist opined that many journalists are ignorant of the tenets of different faiths, often lumping all religions with one another. 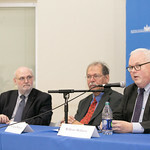 Many of those in the audience agreed with McGurn about that sentiment. 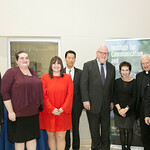 In fact, a live poll conducted before the event showed that a majority disagreed with the statement that religion is covered fairly in the news media. 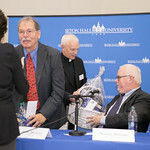 This phenomenon was discussed further in an interactive panel discussion with interreligious media and communication thought-leaders including Jim Goodness, vice chancellor and director of communications for the Archdiocese of Newark; Dr. Athar Murtuza, an associate professor of accounting at the University who studies accounting ethics and social justice as perceived by various faiths; Yael Katzwer, managing editor of the West Orange Chronicle and News-Record of Maplewood & South Orange and former freelancer of the New Jersey Jewish News; and Ashley Turner, editor-in-chief of The Setonian, the University’s student newspaper. 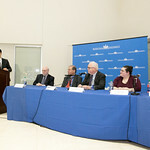 The panel discussion was moderated by Dr. Ki Joo (KC) Choi, associate professor and chair of the Department of Religion at the University. 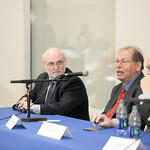 Throughout the discussion the panelists shared their beliefs as to why a disconnect exists between journalism and religion, with several pointing out that reporters often simply prefer to write about controversy. 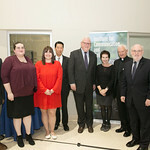 McGurn and the panelists concluded that instead of allowing reporters to perpetuate negative narratives about religion, people of all faiths should openly express their beliefs to combat stereotypes — regardless of how journalists may feel about it. 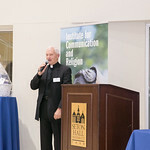 According to Monsignor Dennis Mahon, Ph.D., coordinator for the Institute for Communication and Religion and associate professor of communication, the Institute’s event served as a starting point for those types of discussions. 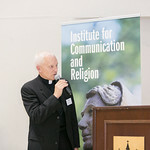 Launched in Fall 2017, the Institute for Communication and Religion provides a nexus for ongoing scholarly exploration of communication topics critically important to religion and society. Curriculum development workshops and a large-scale, interreligious event are scheduled for the Spring 2018 semester.